In the past all patches I did was made from scratch, recorded if I liked it, then torn down. I started working on a live set and got a 22mtk mixer in the process. I noticed that if I start from scratch every time, some things always end up the same place, like triggers 1-6 on the BeatStep Pro would often trigger my 6 drum modules, the green channel is most often used for bass, drum modules most often go straight into mixer, stuff like that. I obviously also think a bit about how it would be live, some conventions and default wiring would help (I imagine) avoid total confusion. So I ended with a set of default patchings. I generally avoid my black cables in patching (easier to follow signals with a random mix of colors), but decided to use my black cables for default routings. So the idea is a bit like this: All black cables are marked with their default patch point, but I'll allow myself to break any default at any time (like sending a drum module into clouds or triggering a drum module from the turing machine instead of from the BSP), but it's easy to go back to the default routing for the next song. When tearing a patch down, I just leave the black cables patched or patch them back to defaults if they were patched elsewhere. It feels a bit "un-modular" and I fear I will get fewer happy accidents .So it might be worthwhile to completely abandon the idea from time to time, but on the other hand, I feel it's necessary with something like this in a live setup. In retrospect, this might be unconsciously influenced by the Richard Divine "one patch for all songs the whole tour" setup, although I feel that's too limiting. I'd like to hear from others that have done something similar, what's your experiences, tips, thoughts, things to avoid, etc? 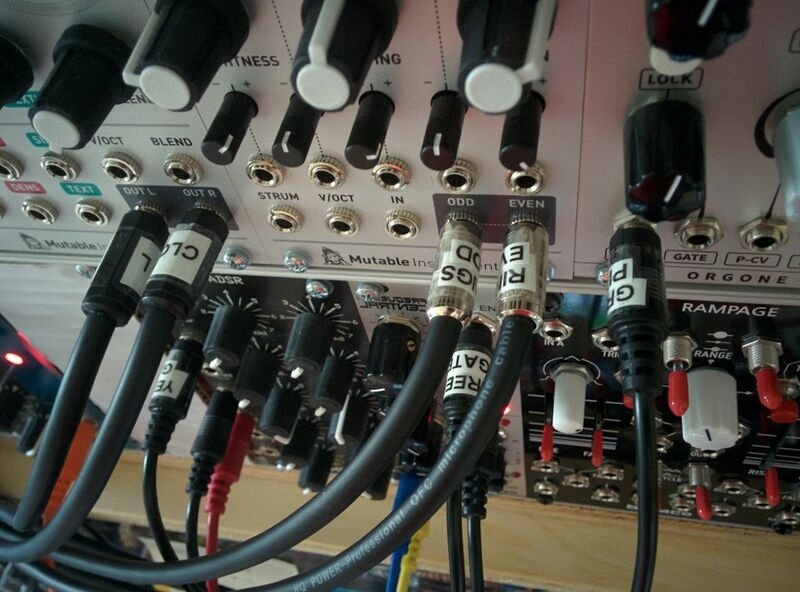 I do pre-patch my modular for live use, but I tend to mix and match the modules depending of what sounds I'm after. Having a matrix mixer module centered of the patch like the 4MS VCAMatrix is a good idea for simple rerouting of signals for unexpected and new results while keeping the patches intact. 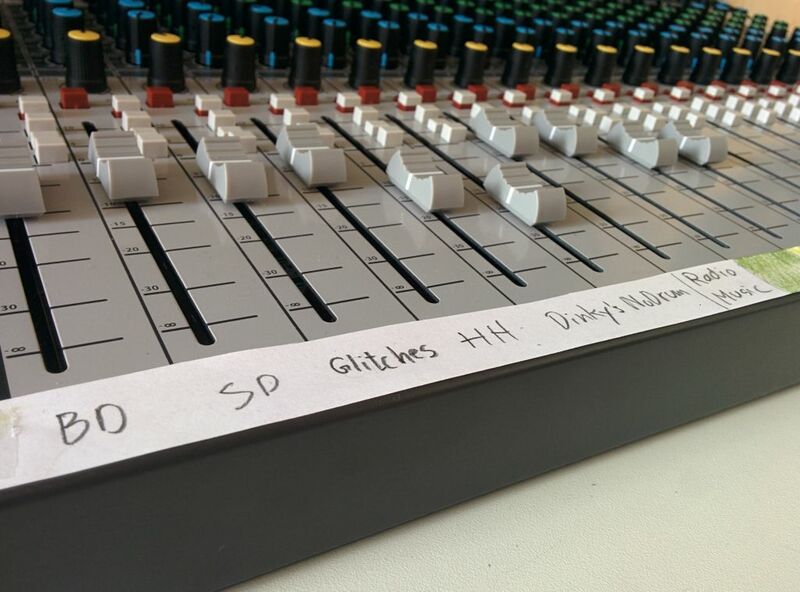 I marked a few outputs to my mixer, but I don't keep it patched. Takes me 1 minute to plug them in. For me this kind of fixed patching will only have benefits for a liveset for on the road, but not in my (home) situation. I have a several envelopes into VCAs which I have pretty much pre-patched because there isn't really any reason not to. For example I have a Quadra next to a Linix which is always pre-patched. So a general consensus (so far) that for live it's a good idea, in the studio it's better to open up. Yeah, I'm planning on doing that also. It's more like I always knows exactly what cable in the modular is having green channel pitch from the BSP and what cable I can plugin for the "final" sound to end up on the green channel marked on my mixer. What happens in between the gate/trigger in and the audio out, is supposed to be whatever I want in that song, and with practice I hope to be flexible and confident enough to patch creatively live. Could you elaborate a bit? How do you use it? I recently looked at the VCAMatrix, the SSM and RYO Paths, not to make "patch connection presets for live use" but for general madness. Maybe it's for another thread, but I'm not sure what the limitations for say the three mentioned modules are, do they all handle both CV and audio. I'm aware that the Paths doesn't have a preset system, so the store-this-routing for live use is out here. Right, I also have a few of those connections. Like attenuator/offset before quantizers. Anyone using these or something similar? I find I mainly wish that I had a bunch of clock signals distributed to various areas by default. I guess it‘s not so much that I wish for semi-modular characteristics as I wish I could use fewer long cables. My past experiments with pre-patching have often been undone inadvertently during un-patching frenzies—pulling patch cables too quickly and indiscriminately. I think this is a good idea, and you've done yrself a service. 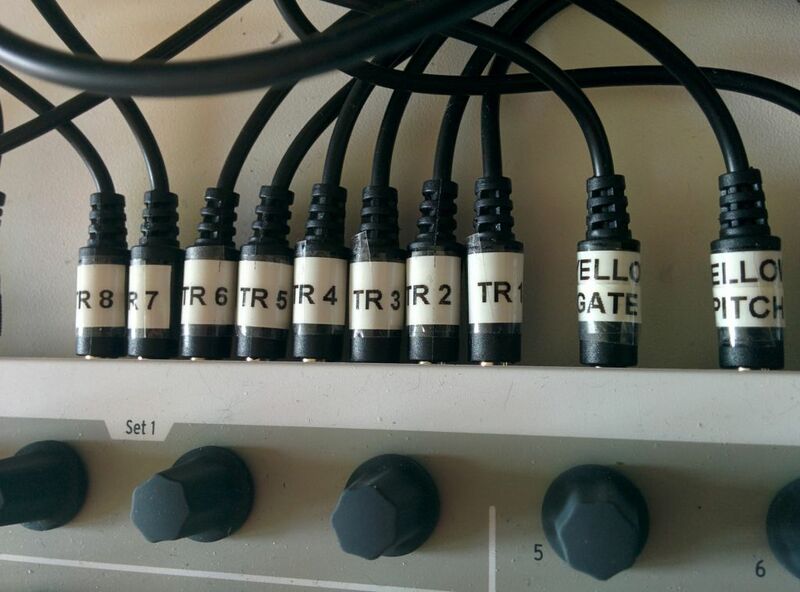 you can always unplug everything and mix it up, but having the cables labeled (protip!) you can always get back to something comfortable. this is just good studio practice. I think the concern about less "happy accidents" is worth keeping in mind, but not stressing about - you'll find your way there anyway. 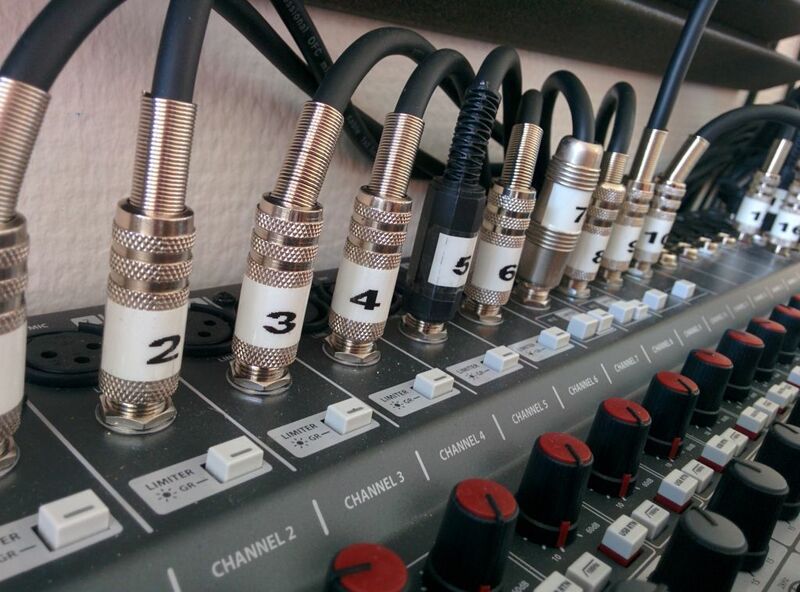 The 4MS VCAM can handle both CV and Audio and if you use it as an simple 4 channel VCA you miss the point IMO. Setting up a scenario where you can send the same input to any of the outputs and also with some feedback patched in is all what matrix mixers are for me. What people might not know is that the VCAM's buttons light up depending on the incoming cv at the cv-input so you can get a quick glance of what's currently going on and just experiment with that. the only pre-patching I do is to link set up my shaping of the vco. other than that everything is start from scratch. I have a smaller set up so I tend to tare it down after every patch. ill record what I want then take it down and start again. I'm kind of like this. Mostly with how I have Yarns patched. MIDI interfaces are not really where the happy accidents come from anyways. I use it mostly in 2M mode so I have the clock and reset outs perma-patched to the QCD and the two CV v/o outputs perma-patched to the top and bottom inputs on an Intellijel buffered mult. This makes it really easy to grab either MIDI channel and/or clock at whatever division I want and if I'm not using MIDI to sequence, I patch into the QCD at a lower point with whatever I'm using and just ignore the mult. I have a similar but much simpler set up for audio out. I'm using a Rosie and have the left channel patched to the mix out of a Tangled Quartet and the right to a six channel mixer I use for drums which lets me balance the drums and synths sub mixes the way I would on a real deck or DAW. I'm not sure if other VCAs act like this but the cool thing about eh Tangled Quartet is that you can patch in to any single output and it removed that signal from the mix. I will sometimes remove these cables when I 'm doing a tear down of a more complicated patch where everything needs to get pulled for sanity's sake but I almost always just patch them back up the exact same way as a starting point. I don't see it as any less modular or experimental. It just saves me time and gets me to the fun bits sooner rather than half way through a patch realizing I need to unpatch stuff because for e.g. I didn't mult my v/o signal. I have a patch that I keep for months. I only tear it down when I need to swiffer off the dust from my system. I use these occasions for patch experiments but I find myself returning to my default patch quickly. /off switches and mixers which make repatching stuff pretty much obsolete. This way I can focus on practicing to make music on my system instead of spending lots of precious time with messing with cable spaghetti. the only thing i always maintaing is the outputs and inputs scheme from my eurorack to the mixer. i have 3 lines i usually patch from submixers inside the modular. they are usually kept mono. then 3 outs from the er-301, those i sometimes patch 2 stereo, 1 mono. then the outs from the stereo modules (clouds, magneto, big sky) and another mono return (doepfer spring reverb). then i have the sends from the aux sends of the mixer going into clouds, magneto, big sky, er-301 and doepfer spring. i patch the stereo processors mono in stereo out. I always 'normalize' my rack after every session. I have a small system, so usually tear down and repatch each time. 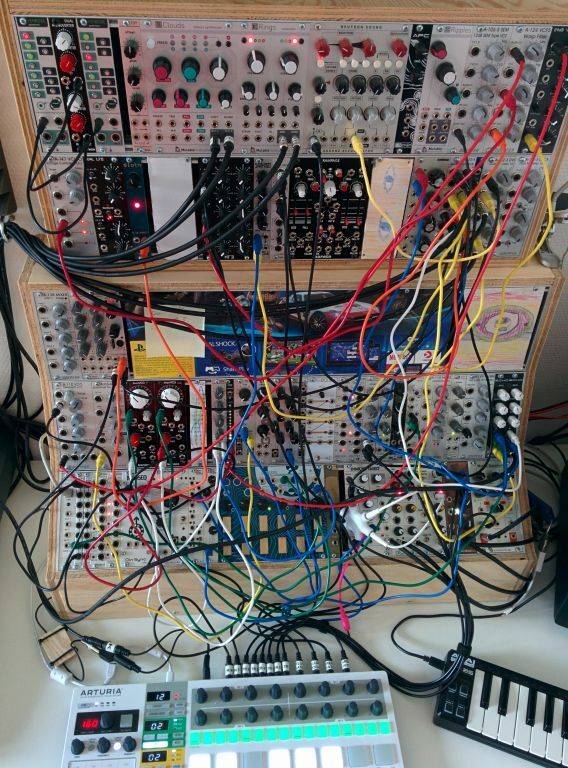 Recently though I’ve been considering keeping patches longer, and exploring each patch more, as it occurred to me that my modular is a meta instrument rather than an instrument, and each patch turns it into a specific instrument which I should spend more time exploring. Yeah definitely, but I think there are different kinds of ideas I can explore within a patch (timbre, piece progression etc.) that creating patches doesn’t touch on as much. One is perhaps about ideas on how I want to form a piece (the patch) and the other is about how I shape the piece (exploring the patch). Obviously there is a lot of overlap, but I’m interested in exploring the ideas.